Adobe has released updates for Lightroom 2.6 and Camera Raw 5.6. These updates provide support for many new camera models along with fixing a couple of bugs. Today Adobe released Lightroom 2.4 and Adobe Camera Raw 5.4. DNG Converter has also been updated. Adobe has released Camera Raw version 5.2 for CS4, with additional camera support (including the Canon 5D Mark II) and several updates to the ACR processing toolset. ACR 5.2 is not compatible with Photoshop versions earlier than CS4. DNG Converter has also been updated to 5.2. Lightroom will be updated to version 2.2 in December to coincide with the new additions. "…we just went over the Camera Raw plug in. We did some custom settings that we saved, and a student was wondering if you can import the Adobe Camera Raw setting in to Lightroom?" If your versions of Lightroom and ACR are in sync with regard to the camera raw version you can use the same presets for both. Find the ACR preset on disk and copy/paste it to the LR Develop presets folder. You will have to restart LR for the preset to show up. Another way to approach this would be to make your changes in ACR, apply the desired settings to the photo, then save out the metadata (either as a sidecar or into a DNG). Then import the file into LR; the settings for that photo will carry over. Then you can save a Develop preset using the settings from that file. 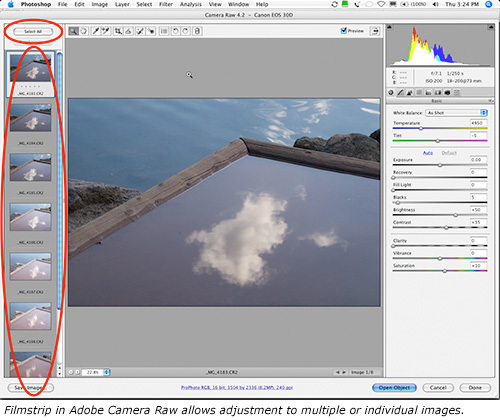 Adobe is moving quickly towards updates specific to the Camera Raw 5 and the CS4 release. Also expected soon is the official update for Lightroom 2.1. A digital photography workflow is the sequence of steps you take to capture, process and output your images. An effective workflow is one that you can follow repeatedly and that will save you time and provide the best possible results. To develop a workflow that suits you, consider your skill level, equipment (camera and computer), subject matter and your intentions for the final images. Your workflow will evolve as your situation changes over time. In Adobe Camera Raw, you can make better contrast adjustments if you pull back the Saturation to -100. Removing the color allows you to concentrate on the tonal relationships in the image. After getting a very nice-looking grayscale image, bring the Saturation back in. 1. Press Cmd+O (Ctrl+O) to open the files into ACR being hosted by Photoshop. 2. 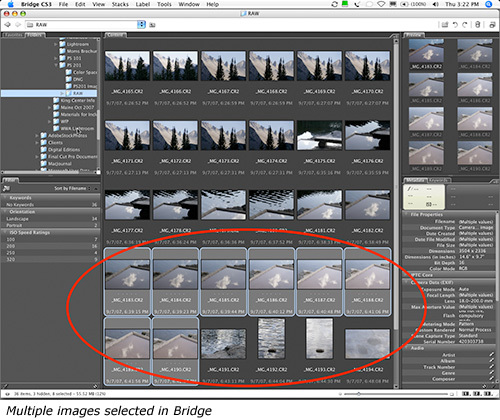 Press Cmd+R (Ctrl+R) to open the files into ACR being hosted by Bridge. Once in ACR, you can select individual images from the filmstrip to apply adjustments or change settings for multiple images. You can synchronize adjustments between files. When you’re done making any adjustments to the raw image settings, press Cmd+A or Ctrl+A to select all the files in the filmstrip, or shift-select specific images to be batch processed. 1. Click Save… to convert the raw files and save as a different format, such as DNG or PSD, without opening the files. 2. Click Open to convert the raw files and open them into Photoshop. 3. Click Done to apply all the changes you made to image settings without converting or opening the images.